In a career which spanned more than six decades and saw appearances in over a hundred films, Leslie William Nielsen had a momentous career to say the least. The Canadian born actor had starring roles in a number of film and television programmes, from Michael Curtiz’s The Vagabond King (1956) and Fred M. Wilcox’s Forbidden Planet (1956), to 1960s television dramas Rawhide and Dr. Kildare. Undoubtedly though, the veteran actor who died last week aged 84, will for many be best remembered for his iconic comic roles as the bumbling Dr. Rumack in cult disaster spoof Airplane! (1980) and maladroit cop, Det. 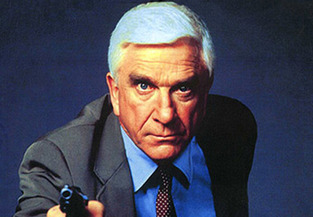 Frank Drebin, in the Naked Gun series. Born in the Canadian city of Regina in February 1926, Nielsen graduated High School at the age of seventeen and enlisted in the Royal Canadian Air Force (although trained as an aerial gunner during World War II he was declared too young to fight). After the war, he enrolled at the Lorna Greene Academy of Radio Arts in Toronto, and whilst studying there received a scholarship to attend the New York based Neighborhood Playhouse. It was in New York, that he developed his passion for theatre and subsequently attended The Actors’ Studio before making his first television appearance in 1948 on an episode of Studio One, alongside Charlton Heston. These humble beginnings quickly expanded to over 50 television appearances within two years, and from here Nielsen started to explore the world of film. Appearing in The Vagabond King, or as Nielsen dubbed it “The Vagabond Turkey” – the film’s limited financial and critical success nevertheless secured him a seven-year contract with MGM – which subsequently saw him star in the universally adored sci-fi adventure Forbidden Planet as Commander J. J. Adams. Tall and prematurely white-haired, these were the highlights to the start of a career for an actor who, although professional and clearly having talent, didn’t bring anything new to the screen. Nielsen began a long career as a character actor, playing an array of villains, cowboys, doctors and officials in films such as Gunfight in Abilene (1967) and the disaster classic, The Poseidon Adventure (1972). Nielsen’s career had the appearance of being seemingly mild and straight, he had been caught in the conveyor belt production line of studio actors, churning out performance after performance, all without gaining the attention he so eagerly craved. Being a “serious” actor clearly wasn’t Nielsen’s forte, his friends noted how off-screen he was a comedian, and perhaps he could succeed if he had the chance to show off his inner-clown on-screen. In 1980 this chance came. After working three decades in the movie business as a straight actor, Nielsen was approached by the Jim Abrahams and the Zucker Brothers to consider playing a character in their upcoming spoof, Airplane!.